Sending children back to school soon? Take the “Master Combo Challenge” to find out just how much both you and your children know about staying safe and secure while they’re away! Young adults are exposed to identity theft and other forms of security threats more than people of any other age. 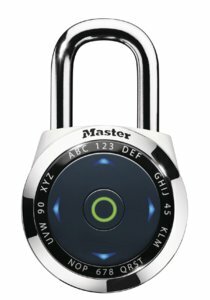 To combat this trend, Master Lock® is launching “The Master Combo Challenge,” an interactive game accessible through the company’s Facebook page. Students and their parents can play the game to not only discover tips on how to stay safe at school but the best products that will keep their possessions secure. The “Master Combo Challenge” also offers parents and their students a chance to win back-to-campus-themed prizes, including the new Set-Your-Own Combination SafeSpace™ Laptop Computer Lock. Play the game and ensure that a safe, secure, and successful school year lies ahead for both you and your children! The dialSpeed(TM) Electronic Padlock allows users to store multiple set-your-own primary and guest codes. Each lock is also preprogrammed with a unique permanent Backup Master Code users can retrieve from masterlockvault.com - ensuring they never lose their combination again! Always keep your dorm room locked! If you do not have a password on your smartphone or laptop set one up. It will prevent someone to use your phone and ring up some unwanted charges. If you use a locker in school always use a lock and make sure it is locked before you leave. If you believe that something was taken from you ALWAYS report it to the campus security. Always walk with a buddy especially at night. Disclosure: I am entering a contest for a Master Lock back-to-school prize pack as a member of the Mom Bloggers Club.